Devils Backbone Basecamp & Meadows is located in Roseland, Virginia at the base of Wintergreen Mountain at the intersection of Routes 151 and 664. The smoke-free craft brewery and restaurant is open 7 days a week serving both lunch and dinner. Sunday Brunch or Lunch 11:30AM. Featured specials every Sunday to pair with your favorite award winning DB beers, hard cider, or handcrafted cocktail. 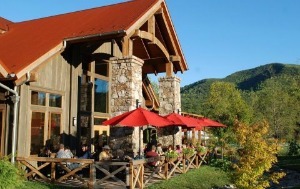 Sit back and enjoy the views of the Blue Ridge Mountains on our outdoor terrace! Check events calendar for special events and live music. Pets – We are dog friendly outside in the meadows – pets must be on a leash per county law.